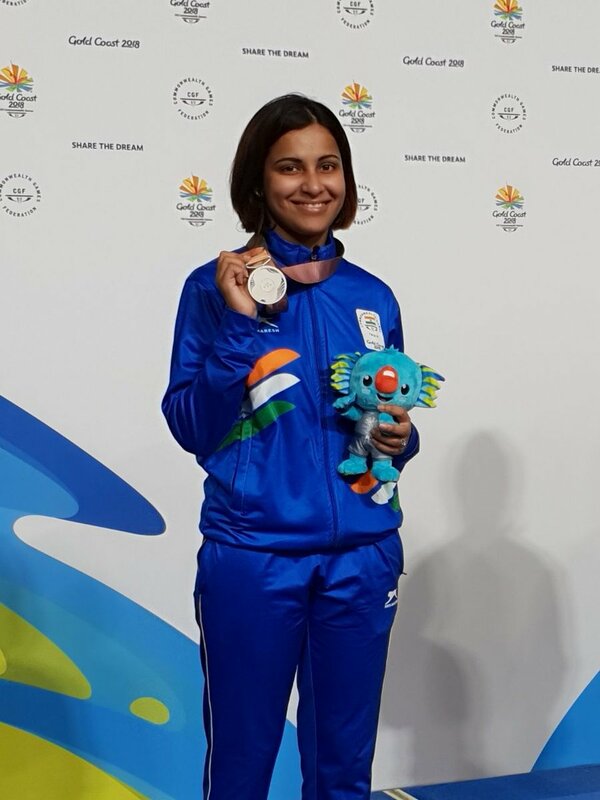 As the Commonwealth Games entered the sixth day in Gold Coast today, shooter Heena Sidhu won women’s 25-meter pistol gold for India. However, her compatriot Annu Singh was eliminated from the same event. This is Heena’s first CWG individual gold medal – and second overall, after a team gold in 2010 – and second of the ongoing Gold Coast Games, after she claimed silver in the 10m air pistol event on Sunday. Overall, India’s shooting contingent have won eight medals in Australia. Having remained in the top three during the finals, Heena moved into top spot with a sequence of 5, 5, 4 and 4 and then pulled marginally away from the next best, Australia’s Elana Galiabovitch, with final shots of 3 and 4. Heena has made two trips to the CWG in 2010 – winning a gold in the team 10m air pistol event and silver in the individual 10m air pistol – and 2014 where she qualified for the 10m final but failed to leave a mark. Outside of the CWG arena, Heena’s career graph includes several highs. In 2010 she won silver at the Guangzhou Asian Games; in 2013, at the ISSF World Cup Finals in Munich, she shot for a world record score that fetched her a gold medal; in 2014, she shot silver at the ISSF World Cup and added another feather in her cap when she became the first Indian female pistol shooter to scale the World No 1 ranking. In men’s hockey, India came up with an inspiring performance against Malaysia to beat their Asian rivals 2-1 and qualify for the semi-final. Drag Flick specialist Harmanpreet Singh scored both the goals for India. India will now take on England in their last group encounter. In boxing, Amit Panghal and Naman Tanwar advanced to the semi-finals, assuring themselves of medals. Panghal defeated Scotland’s Aqueel Ahmed in a split 4-1 verdict in the light flyweight 49 kilogram category. Naman Tanwar defeated Frank Masoe of Samoa 5-nil in the quarter-final of men’s 91-kilogram category. In badminton mixed doubles, the Indian pair of Satwik Rankireddy and Ashwini Ponnappa won 2-nil against Stuart Hardy and Chloe Le Tissier of Guernsey in just 20 minutes beating them 21-9 in the first game and 21-5 in the second. Indian squash players Dipika Pallikal and Saurav Ghosal comfortably defeated Guyana’s Mary Fung-a-Fat and Jason-Ray Khalil 2-0 in a mixed doubles Pool E clash. Dipika and Saurav will next take on Pakistan’s Madina Zafar and Tayyab Aslam. There was disappointment for India in men’s shooting as both Gagan Narang and Chain Singh failed to win any medal in the 50-meter rifle prone. Gagan Narang was being touted to be a gold medal prospect for India in the event. Action in boxing, squash, lawn bowls, table tennis, athletics in going on at the Commonwealth Games which includes many Indians. In women’s hockey, India will take on South Africa today. Mohammad Anas will compete in the men’s 400 meter finals. Australia with 109 medals, including 41 gold continues to top the tally followed by England with 69 medals, including 23 gold. India is placed 3rd in the tally with 20 medals comprising 11 gold, 4 silver and 5 bronze.